Last night is another case of us sitting down, saying we had nothing to talk about… and then ending up talking for an hour and a half about everything imaginable. We talked about Ashgar and the insanity he is currently going through working on his Relic Novus in Final Fantasy XIV. We talked my recent journey back into Bravely Default and how that game requires a certain measure of degenerate play to defeat encounters after a certain point. We talk about Tam’s brush with near death as he decides that no one should ever be bit by a Black Widow spider because it hurts like hell. I talk about my experiences in Blackrock Foundry and the World of Warcraft selfie toy filling up my twitter feed. I talk about hitting level 80 on my first character in Guild Wars 2… and how empty it feels since the last 15 levels or so were essentially given to me for logging in daily. Our longest discussion however that spawned the quote that I am using for the title of this show was about board games and miniature gaming. We talk about “long” board games, those taking several hours to play out… and the frustration of having to devote that much time to a game you are essentially “behind the curve” in the entire time. We talk about games that require less time to get into and play, and that can be played for a number of times in a single evening. This also spawns a discussion into miniature gaming talking about the problems with Warmachine and Warhammer 40k contrasted with some of the strengths of Infinity. As always it is a long rambling discussion between a bunch of friends, and since you apparently like that as AggroChat listeners… then this should be a banner episode. Yesterday was a pretty huge day for Final Fantasy XIV in that Yoshi P was at Pax East giving a presentation on the upcoming expansion. Thankfully it was live streamed to the internet, and you can check out the entire presentation from yesterday over on their twitch video on demand page. Honestly at first I thought it was going to be a disappointing repeat of all of the information that had come out of the Tokyo Game Show back in December. 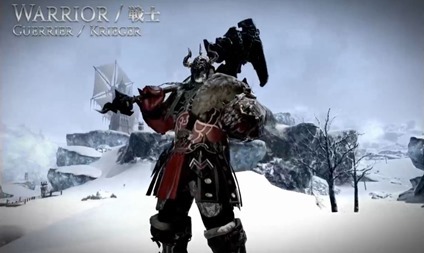 The show started with essentially revealing the same information about the Au Ra race and the three new classes that happened during that show. However quickly it segwayed into showing us things like the amazing level 60 class sets. The above image is that of the Warrior set, and while I still intend to play Dark Knight as my main… I have to say I will be rapidly leveling Warrior as well. Instead of breaking rocks with axes… they seem to have just skipped a step and made the axe itself out of a rock. 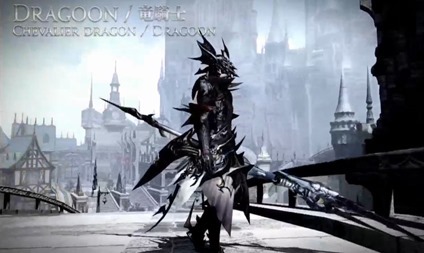 Since this is essentially the expansion of the Dragoon… you would expect the level 60 class armor to be amazing. As the above image shows it was well worth the wait. My biggest hope is that they don’t have the female “belly hole” problem that the earlier dragoon armor had. I have to say though that I will continue poking things with a spear if for no reason other than the collect this gear. As usual I was not quite so amped about the caster sets, but then again I never really am. I have no clue what is going on with the Black Mage set , at least the current set is something I would happily wear. This set is a bit more “demon lady gaga” than anything else I can think of. If you want to check out all of the new class armors you should hit up this youtube video that shows each set in action. I am happy that maybe just maybe I will finally have a Bard set that I am not ashamed to wear. 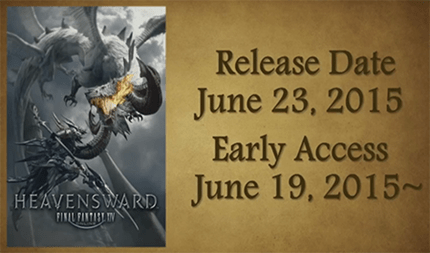 The biggest news to come out of yesterday is a firm and concrete release date for the first Final Fantasy XIV expansion… Heavensward. Within the next few weeks they are apparently releasing a brand new benchmark application to allow us to test out the Direct X 11 changes, and play with all of the racial customization options on the Au Ra. If this works like the previous benchmark it should allow us to export our saved characters and then import them into our actual game client. On March 16th the pre-orders will open and like usual the physical collectors edition is going to have some sort of a big dragon statute pack in. Apparently earlier they had announced that we would be getting a flying dragon mount as part of the collectors edition as well, which in truth are the type of rewards I care a bout. All of this time we had heard “spring 2015” for the release date, but it turns out that the game will be launching on June 23rd with early access starting June 19th… so not spring but summer. It turns out that they apparently did have a May date in mind for the launch, and they tried to make it. However as Yoshi P apologized they wanted to make sure they had a very polished product for launch. I for one support pushing back by a few weeks to make sure we have a really polished game, because really… the first expansion is a crucial time for any game. I want to make sure they are able to keep this quiet momentum they seem to have going into the new content. That said we also still have one full major patch waiting in the wings, and I am not sure there would have been enough time for us to really get to complete that content before the expansion anyways. I feel like that is the prime difference here as there is with other expansions. Most expansions land at the tail end of a six month or longer lull with no new content. In the case of Warlords of Draenor it was at the end of a 16 month lull… even with the impending expansion… they still have content releases planned up to the moment 3.0 launches. So in the mean time I will be working on my crafting… because it sounds like we are going to need a team of crafters to complete our free company airship.